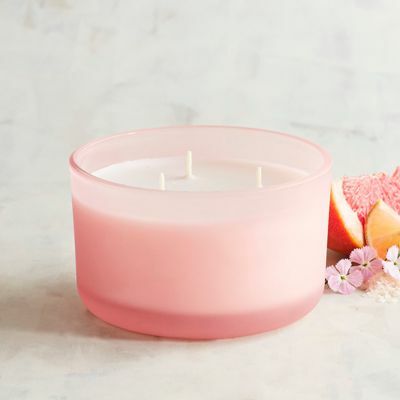 I couldn’t find a picture of the boxed candle I purchased at Pier 1 but there are several different styles to choose from that are still available. I’ve pictures the 3 wick candle above. They’re very pretty candles. Light pink and girly. I’m not sure if the boxed candle I purchases was a limited addition but if you see it, definitely get one. The box is gorgeous and it makes a great gift. Reading the description and smelling the candle… sounds about accurate to me. I smelled pink grapefruit first (definitely the dominating scent) and then strawberry second. It smelled very uplifting and bright. A scent you’ll want to burn when you want to freshen up a room and air it out. That’s what this scent reminded me of. I liked it! Now let’s see how it performs! I decided to stay conservative and light this candle in a small room to start out. Once the wick was lit, it took a good 30 minutes to reach a full melt pool and the aroma… so fresh and lovely! My bathroom smelled exactly as the description boasts… pink grapefruit blended with sweet strawberries. It didn’t just smell like citrus and berries, it smelled bubbly and effervescent. I loved it! Strength – I would rate this candle a 10 in a small room. 8 in a medium. If you want to try this scent in a large room, they their 3 wick candle. 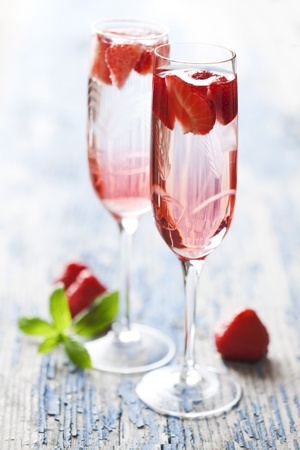 Loved Pink Champagne from Pier 1 and recommend it to all you fresh and fruity lovers out there. I took deep inhales of this one and smiled from ear to ear every time I walked into the bathroom I had it burning in. Yes, I’m definitely picking this candle up again next time I’m at Pier 1 and hope it sticks around for a while.